About: Tir Na Nog is an Irish pub that has live traditional Irish music on Friday and Saturday evenings. They have a disco on Sunday which plays a wide range of music, and they also televise major sporting events on Sky TV. There is a beer garden at the rear of the pub. Serving a variety of Thai dishes, they can cater for private parties of up to 100 people upon request. 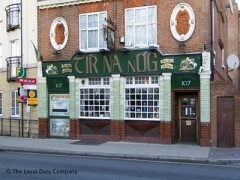 With a mythological name that has something to do with the land of eternal youth, the Tir Na Nog is Wandsworth’s most famous Irish pub. Owned by a small Irish family, it relies on its authentic roots and traditional approach. There’s a pool table, good Irish music, football and one of the most welcoming atmospheres around.